Wrapped around the toe of Italy's boot, this region in southern Italy is off the beaten track for tourism and foreign investment; Calabria is one of the country's poorer and less developed areas, and the Pollino Mountains keep it almost isolated from the rest of Italy. But this mostly forested and mountainous region is blessed with an attractive climate and rugged, unspoiled natural beauty. Sometimes called the "Caribbean of Europe," Calabria is hot and dry along the coast in the summer, where even the winters are quite mild-temperatures never go below 10ºC. In the mountains, it's a different story: the climate is almost Alpine, and in winter temperatures can drop below zero. 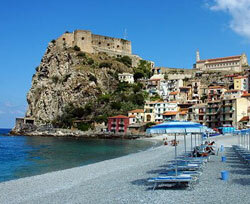 Calabria's coastal areas feature lovely, rarely visited beaches. Inland, the variegated landscape includes mountains, big lakes, and pine forests. Ancient Greek ruins lie scattered around the region. Calabria was home to thriving Greek colonies until 132 BC. Byzantine churches and the occasional Norman castle also dot the countryside. Calabria has many old hillside towns still follow the traditional Calabrese way of living, as if they've been forgotten by the modern world. You'll see young children playing and old people gossiping or smoking, but most of the working-age population will be away, for there is little employment in the hill towns. Calabrese cuisine is known for its sausages and seafood in particular, and like the food in neighboring Sicily it tends to be spicy. The region grows plenty of wine, though it's not considered of a high international standard. Due to Calabria's remoteness and lack of development, few people here can speak English. There are some dangerous roads in its mountains, and worse, there is much crime here due to poverty, although foreigners are not common targets in major crimes. The Mafia is known to be active in this area.